Double Exposure: Plays of the Jewish and Palestinian Diasporas is a groundbreaking anthology of plays about the Israel-Palestine conflict penned by diaspora playwrights of Jewish and Palestinian descent. This volume of seven plays—three by Jewish playwrights, three by Palestinian playwrights, and a collaboration by both—tackles one of the remaining thematic taboos for many theatres in the Western world. Varying in genre between drama and comedy, in aesthetic between realism and surrealism, in setting between the Diasporas and Israel/Palestine, and in the political opinions of their characters, Double Exposure offers distinct Diaspora perspectives that turn the political into the personal. A Q&A addendum with each of the playwrights explores the inspirations and challenges they experienced writing and staging their plays, and introductions by acclaimed playwrights Karen Hartman and Betty Shamieh offer insightful commentary. This collection includes The Peace Maker by Natasha Greenblatt; Sabra Falling by Ismail Khalidi; Bitterenders by Hannah Khalil; Facts by Arthur Milner; Sperm Count by Stephen Orlov; Tales of a City by the Sea by Samah Sabawi; and Twenty-One Positions: A Cartographic Dream of the Middle Eastby Abdelfattah AbuSrour, Lisa Schlesinger, and Naomi Wallace. 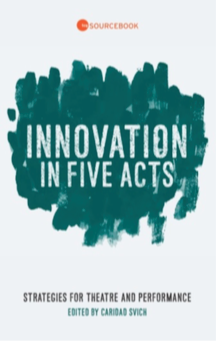 ​Innovation in Five Acts launches TCG Books’ new Sourcebook series, which publishes content inspired by TCG’s programming. Originally catalyzed by the TCG National Conference’s focus on artistic innovation, this inaugural volume contains forty essays from admired professionals of the national stage. Curated by Caridad Svich, the collection contains inspiring and innovative techniques for creating theatre from playwrights, directors, performers, teachers, dramaturgs, artistic directors and founders—each sharing the creative challenges and triumphs of developing original works in today’s industry. Since its inception a decade ago, the ground-breaking Monologues for Women by Womenseries has increased the breadth and the quality of original material available to actresses. In this latest volume, editors Tori Haring-Smith and Liz Engelman present sixty-one previously unpublished monologues written by some of the most inspiring and exciting women now emerging onto the international stage, as well as some names already familiar to followers of the theatre.